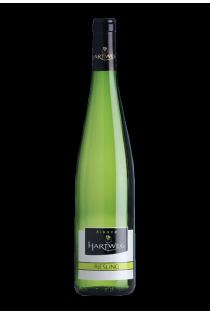 Just a few kilometers from Ribeauvillé and Riquewihr, the domaine Hartweg is located in the heart of the Alsace vineyard in the small village of Beblenheim. Here, in this typically Alsatian half-timbered setting, the Hartweg family exploits its 9 hectares of vines, respecting the terroir and the traditions. The Hartweg estate produces Grands Crus, thanks to its marl-limestone terroir. The Mandelberg (Almond Coast) in Mittelwihr is planted mainly by Gewurztraminer and Riesling. It gives very fruity and fine wines, which supports a guard. The Sonnenglanz in Beblenheim benefits from a microclimate that has made its reputation for a long time. It gives letters of nobility to the grape varieties grown there, especially Gewurztraminer and Pinot Gris. This terroir of exception gives wines to the gilded robe, marked by a great aromatic power and good persistence in mouth. Hartweg growers work the vine in the most delicate way possible: green manure and grass: planting wheat or barley to aerate the soil. The grapes are harvested at the optimal maturity of the grapes, and are entirely manual.